Dragon of the Third Age who took over the Lonely Mountain. 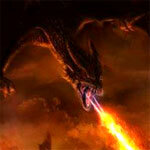 Smaug breathed fire and could put people under a spell by looking them in the eye. He was also very greedy and desired gold and mithril. Smaug was originally from Forodwaith. In 2770, Smaug took hold of the Lonely Mountain. It was originally owned by Dwarves. He killed many, but some, such as Thror, Thorin, and his father Thrain II, escaped. He also haunted the Kingdom of Dale, which was located below the Lonely Mountain. The King of Dale, Girion, was killed by the dragon. Smaug went inside the Mountain, killed the dwarves, and took all that they had worked to mine. He then built a bed out of all the jewelry and slept most of the time. But about once a month, he hunted Maidens in Dale to eat. Soon, the nearest person to the Lonely Mountain lived in Esgorath, or Lake-Town. In 2941, Thorin Oakenshield and Gandalf met. Thorin told Gandalf that he wished to reclaim the Lonely Mountain. So, the two planned to gather a company of thirteen dwarves and a burglar, who was the hobbit Bilbo Baggins. He entered Smaug's dungeon in 2941. He stole one of Smaug's golden cups. Smaug left to find the burglar but only found his ponies, who he thought belonged to the Dale Men. He went back to his dungeon and slept. Bilbo came back later while invisible. He was invisible because he was wearing the Ring of Power. He talked to him and Smaug said he was unable to be defeated. Then he showed him all of his jewelry on his stomach but Bilbo ran off and Smaug breathed fire at him. Bilbo was unscathed. Smaug flew out of the Mountain and over the town of Dale to kill people. He was slain by Bard the Bowman, who became King for this heroic act. Though there was much arguing over Smaug's gold, which erupted in the Battle of five Armies.